Truly elegant and unique line of grill and fire pit tables from California Outdoor Concepts. The San Simeon Signature Series Outdoor Fire Pit / Patio Tables bring the warmth and beauty that only the dancing flames of an outdoor fireplace can provide. The San Simeon series outdoor fire pit table comes with your choice of a 48" granite table top in Sunset Gold, Pebble or Sea Green. The San Simeon table can also be converted into a cooler top table with the purchase of the ice bucket and adaptor ring. 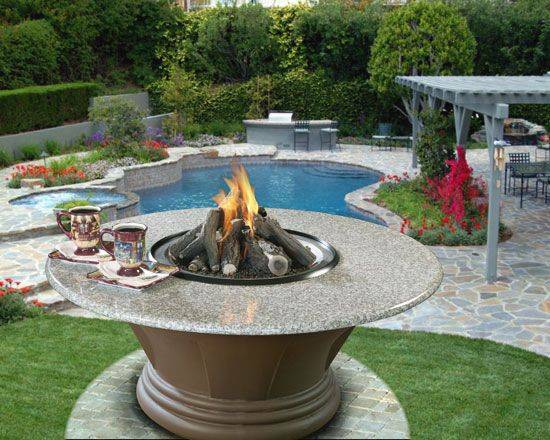 The multifunction capability fire pit table guarantees that your personal selection will be yours alone. Each table is made per order and assembly is quick and easy for 2 people. The San Simeon Base is constructed of heavy duty glass fiber reinforced concrete (GFRC). The 1 1/4" thick granite table top is all weather resistant natural stone. Unlike mosaic tops there are no grout lines to crack or mildew. The table tops are easy to maintain and natural stone adds value to any home. 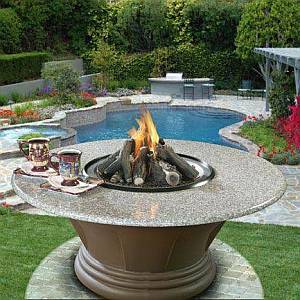 Fire pit options include your choice of ceramic gas logs, or colored glass (Clear, Smoke or Bronze) at an additional cost. The San Simeon series is 23" tall and the granite top is 48" in diameter.. All units are shipped LP Propane gas ready, unless you designate natural gas on your order at no extra charge for a limited time! Matching 23" Granite insert available also at an additional cost.